Are Hidden Cameras Watching You Right Now? You won’t believe how small hidden cameras are these days. Often no bigger than a pinhole, these tiny spy cameras are concealed inside everyday objects such as clocks, glasses, lamps, picture frames, USB chargers, keychains, desktop fans, outlets, smoke detectors, DVD players, fake water bottles, air fresheners and so much more. These tiny cameras often are built with advanced recording and offsite streaming, allowing unauthorized people to watch and record your activity, and in many cases, using your compromised activity demanding money or else threaten you with releasing the footage to the public. The news is dominated by horrified unsuspecting people getting their privacy destroyed by digital peeping toms who have installed hidden cameras in Airbnb, cruises, hotels, dressing rooms, apartments and many other locations people thought were safe. Until now, unsuspecting people had no way to know if their privacy is being violated until it's too late. Now with SpyFinder® PRO, travelers can feel safe from prying eyes when arriving to new locations. When the power button is “pressed” on side of unit, and you look through the viewfinder, it activates six special bright-red LED strobe lights designed to bounce off the smallest of camera lenses. The tiny camera lens will appear to blink back at you as a reflection off camera lens itself , instantly giving away its location as you scan the area around you. It doesn’t matter if the camera is turned on or off, recording or not...even if its a non-working camera, the blinking effect will clearly show you the presence of a camera lens which is almost impossible to detect with the naked eye. Knowing where the camera is located will allow you to take immediate action to prevent unauthorized recording of activity. In addition, there are 3 LED intensity levels which helps hone in on camera lenses which could be hidden behind different surfaces. A flat wall 30 feet away could use the highest LED intensity, while a semi reflective shiny surface 5 feet away would use the lowest intensity. This prevents false reflections, maximizing the ability to find a hidden camera lens in any room environment. Who Should Use It & Why? Anyone concerned about any invasion of privacy in your home, or out and about during your day. Hidden cameras have no boundaries when it comes to watching and recording people. They could be watching you or your loved ones in your own home, hotel rooms, at work, at your child's nursery, dressing rooms, locker rooms, bathrooms and more. It takes a few seconds to pull this out of your pocket or handbag to sweep a room you’ve just entered. Where Are Unauthorized Hidden Cameras Found? The SpyFinder® PRO can NOT find audio recording devices, GPS Trackers, self recording devices or alarms. 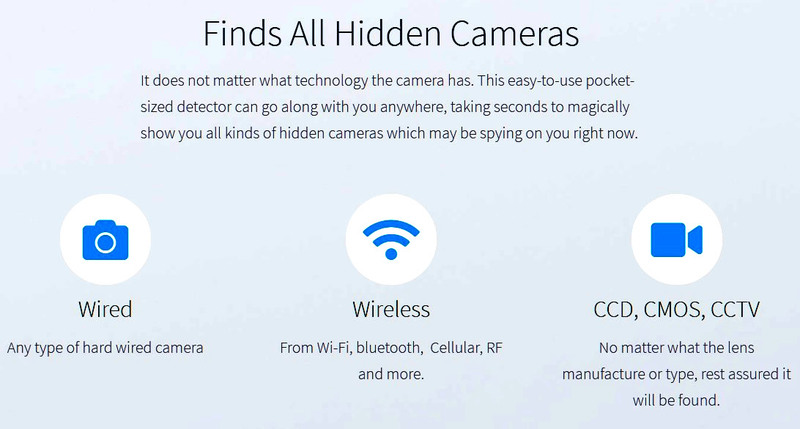 This can ONLY find hidden camera lenses which might be spying on you. 3 LED intensity modes allow you to control and hone in on the area you are sweeping. High is the brightest, best for larger rooms, and open office or living spaces, and Low is dimmer intensity, best for smaller rooms, bathrooms, dressing rooms and shiny surfaces such as plastic or glass. This prevents false reflections, maximizing the ability to find a hidden camera lens in any room environment. The lens of the hidden camera will appear as a bright point of blinking light when you illuminate it with the light beam and view it through the SpyFinder Pro view finder. Is Your Family Safe From Unauthorized Cameras? With the Spy Finder Pro, you will always feel Safe and Secure knowing that you’ll never be put in a blackmail or extortion situation where someone may have a private hidden video of you. We strive to help empower unsuspecting people and make the world a safer place with an extra level of personal privacy when having concerns of frightening behavior in public/private spaces. Audio devices may not be used to violate the privacy rights of others. In no way will Lawmate Technology or its subsidiaries or partners be held responsible for inappropriate use of these products. YES! We ship worldwide. On International Orders, any CUSTOMS FEES are the responsibility of the purchaser NOT LawmateTechnology.com. Every country's import rules are different, so it's impossible to guess how much, and if any fees may apply. REQUESTS TO RETURN PRODUCTS MUST BE OBTAINED FROM Lawmate Technology WITHIN A TEN (10) DAY PERIOD AFTER THE CUSTOMER HAS RECEIVED THE PRODUCT(S). All products which are special ordered by the person ordering and are NOT subject to cancellations. Due to the nature of our product line, returns will only be accepted for products damaged upon shipment to the customer*. All returns must be authorized by LawmateTechnology.com before product(s) is returned. LawmateTechnology.com will replace, refund, or credit your account for returned product(s) at LawmateTechnology.com's discretion. We have been forced to implement this policy because of the attraction of our products to unscrupulous people who return products after they have profitably gained from the short-term use of the products. *Special exceptions may be made on a case by case basis determined by LawmateTechnology.com. In this event, returns are subject to deductions for shipping costs and a 25% restocking charge and must be returned within a ten (10) day period from date of receipt of product(s). NO refunds will be given for products returned without explicit permission from LawmateTechnology.com. Any return must be authorized by a representative of LawmateTechnology.com and under no circumstances will returns be accepted otherwise. Authorization and shipping instructions must be obtained from LawmateTechnology.com. No returns will be authorized after ten (10) business days of receipt of product(s) by the customer, unless found to be defective, in which case we will replace at no charge once returned with authorized RMA. We at LawmateTechnology.com strive to offer our customers the best products at the best possible prices. Due to the nature of the products, returns will not be accepted unless the product is found to be defective or unless otherwise explicitly stated on the specific LawmateTechnology.com product page. Every product receives FREE LIFETIME SUPPORT. We guarantee all LawmateTechnology.com products to be free of defects in workmanship and material for 90 days (some manufacturer's warranty is one (1) year or lifetime - please see info on the page for specific product's details) after sale to the customer. We will replace or repair the product(s) at our option providing there is no evidence of customer misuse, or alteration. All Lawmate products come with no-hassle free support for the lifetime of the product when purchased from our store. © Lawmate Technology USA All Rights Reserved.